The Seven Years' War was the pinnacle of 18th-century warfare, with dramatic campaigns and battles, famous leaders, and wide variety of colourful uniforms. Compared with the later Napoleonic Wars, tactics were simpler, armies more professional, and battles tended to be smaller. Using these quick-to-learn rules, players can bring this period to the tabletop, recreating anything from a small skirmish to a major pitched battle. 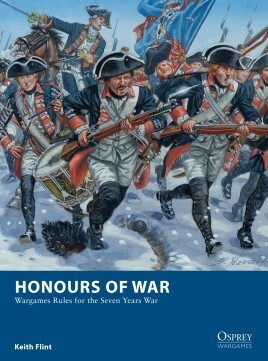 Although simple, the rules allow for a wide range of tactics and reward historical play. That said, fog of war sometimes produces unexpected results and units don't always obey their orders! The game moves quickly, and players must be prepared to regroup and counterattack or to press home an advantage - a lot can happen in one move!